No, seriously. Like way up in space and the upper atmosphere, where space weather can affect communications and GPS satellites—and knock a space station out of the sky. Or closer to home, where radiation makes it through the atmosphere and can interrupt electrical transmission grids and force airlines to reroute flights, messing up business for lots of people. That’s actually a big issue, one that government agencies like NASA and the National Oceanic and Atmospheric Administration (NOAA) are spending a lot of money trying to address. 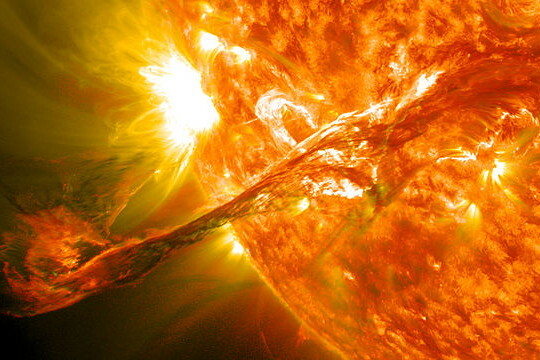 Their data and warnings give the military, government, and companies that operate satellites and power grids advance warning of changes in space weather in time to make plans that can protect expensive and critical assets. To do so, they’re relying on satellites and instruments built in, and controlled from, Colorado. The University of Colorado-Boulder’s Laboratory for Atmospheric and Space Physics (LASP) recently completed the first of four instrument packages it is building for four NOAA satellites due to launch in 2015. The suites will cost about $95 million in total and are named Extreme Ultraviolet and X-ray Irradiance Sensors, or EXIS. The four satellites NASA plans to launch are part of the Geostationary Operational Environmental Satellites (GOES) program. They will be assembled at Lockheed Martin Space Systems’ satellite assembly facility in Littleton, CO. While in Littleton, the sensors will be integrated with the satellite bus and tested. Satellites are surprisingly big business in Colorado. In addition to Lockheed Martin, Ball Aerospace and Technologies and Sierra Nevada Corporation develop and build satellites and space instruments in the Boulder-Denver area. Military bases around Colorado Springs, including the legendary NORAD base inside Cheyenne Mountain, make that area a major center for satellite operations and communications. EXIS features two instruments, one that monitors X-rays and one that monitors ultraviolet radiation, LASP senior research scientist Frank Eparvier said. He is the principal investigator for the program. They are part of a 66-pound package the size of a large microwave oven that was designed, built, and tested at CU, according to a release from the university. The sensors are a step forward and will improve space weather research and prediction capabilities. “Our instruments are the next generation. They’ve flown x-ray sensors for the past three decades. We’re building new and improved instruments with a larger dynamic range,” Eparvier said. Space weather is caused by solar activity, so EXIS monitors the sun. The x-ray sensor is on the lookout for solar flares, which unleash amounts of energy roughly equivalent to millions of atomic explosions. They can create what are known as proton storms that can harm satellites and astronauts in space and interfere with communications transmissions, Eparvier said. The amount of radiation coming from the sun can vary by orders of magnitude in just a few minutes. With the new x-ray sensor, scientists at the NOAA/National Weather Service Space Weather Prediction Center in Boulder will be able to detect changes in timing, magnitude, and direction within five seconds, Eparvier said. Then, just like the NWS reports weather events such as hurricanes and storms to meteorologists, the center sends out warnings that are picked up by satellite or grid operators. Around LASP, the x-ray sensor is important enough that they’ve dubbed it “the money instrument,” Eparvier said. Meanwhile, the UV sensor monitors changes that affect conditions in the upper atmosphere. In certain conditions, upper atmosphere ionization can disrupt cell phone and GPS communications. It also can create satellite drag. That’s actually what doomed the ill-fated Skylab project, Eparvier said.